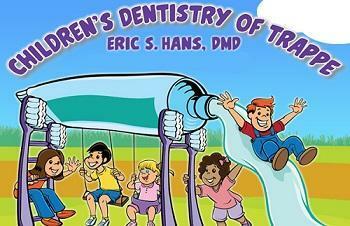 "I love Dr. Eric's office and so do my children. Everyone is very friendly and we have never had to wait." "Dr. Eric and his staff are absolutely wonderful (especially Desiree!)! I've recommended Dr. Eric to many friends and relatives and will continue to do so. I am thankful that he is in our area (although I would drive a long distance if I had to) and am truly grateful for the wonderful care my children have received. "I always feel welcome in your office. The staff are friendly and I feel like they know me even though I'm only there twice a year. The office atmosphere is child friendly. Most important my kids enjoy going to the dentist, they never complain. Thanks for asking my opinion I'm glad to know I matter." "Wow! What a fantastic first visit for my kids! We moved into the Trappe area over the summer months, and needless to say I was very anxious about how my 2 year old would react to a new dentist. Dr. Hans really knows his stuff and I am happy to say Amelia had a great time at her appointment! Actually asked if we could go back to the dentist when we got home. Thanks so much Dr. Hans and his wonderful staff!"